A new focus on the floral beauties of France has been devised to add a greater bloom to the French tourism picture this year. You don’t have to be an agronomist or gardening enthusiast to know that France has some of the most remarkable gardens in the world, appealing to anyone who appreciates natural beauty. The new program puts an exclamation mark on that. The “In Bloom” program assembles the best of France’s gardens and parks for their time in the spotlight. There are 450 gardens and parks in Paris alone. “Although green spaces don’t necessarily bring new clientele, they are essential when it comes to developing loyalty from returning visitors,” says Atout-France, the France Tourism Development Agency. “Green spaces can seduce with their aesthetics and can even become a destination’s must-see,” says the agency. That is certainly the case with Claude Monet’s famous Gardens, which were not only part of his home but were his source of greatest inspiration. Art lovers will be awestruck by the Nympheus Workshop, while nature enthusiasts will marvel at the gardens themselves. Also a must-see attraction are the Hanging Gardens in Le Havre. This summer will mark the 10th anniversary of these gardens and during the warm months, Le Havre will celebrate 500 years of history. Leonardo’s Garden at the Leonardo da Vinci Park in Clos Luce are adjacent to the Chateau de Clos Luce. Da Vinci’s botanical drawings, geographical studies and landscapes are brought to life in the Chateau. Leonardo’s Garden covers one hectare and is an outdoor museum, landscaped in the spirit of his drawings and paintings. The Pays de la Loire is well known for both its natural and manmade beauty, as the location of many elaborate, designed gardens on the properties of rambling chateaus and palaces. It features the Puy de Fou, a top historical theme park, as well as the Terra Botanica educational park featuring gardens, aquatic areas and greenhouses. 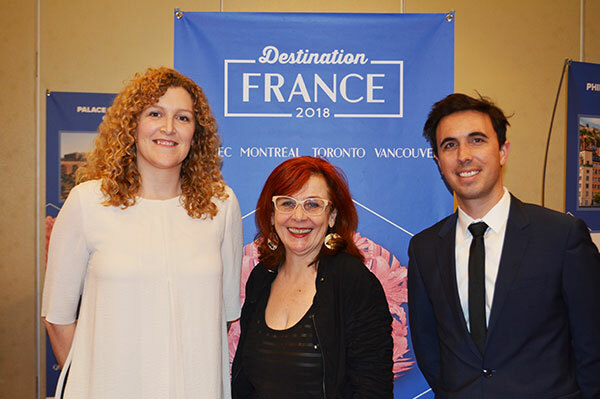 Pictured during a recent France trade event in Vancouver are Melanie Paul-Hus, director of Atout-France in Canada, with Marie-Andree Boucher, press manager for Atout-France, and Vincent Cabrol, business partnership developer for Air France KLM.